Jason Isringhausen celebrates after notching career save No. 300 on Monday night in San Diego. Jason Isringhausen became the 23rd member of the 300-save club, working a scoreless 10th inning in the Mets' 5-4 win against San Diego. "It is special," said Isringhausen, who celebrated with teammates with champagne postgame. "It's the reason I came back was to get 300 -- and I got it. So now it's time to move on for myself and keep playing baseball and hopefully get some more saves before the end of the year." 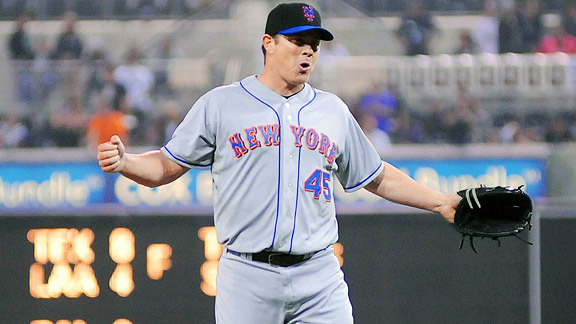 Isringhausen had to wait six days since his last save as the Mets stumbled through a five-game losing streak. "I was thinking about it tonight, sitting down in the bullpen when they tied the game. I'm just wondering, 'Am I ever going to get a chance to get it?,'" he said. "Like I said, it's been a long couple of years for me. I didn't want to see all that happened with Frankie (Rodriguez) and Carlos (Beltran) and stuff, but it put me in a position where I did achieve this. I've already got a couple of texts from Frankie on my phone." Trying to protect a one-run lead, Isringhausen struck out Kyle Blanks to open the frame. He then walked Orlando Hudson and surrendered a single to Nick Hundley. Alberto Gonzalez grounded out to shortstop, advancing the runners. And with two runners in scoring position, Logan Forsythe also grounded out to shortstop to complete the save. Izzy, who came to Port St. Lucie to try out after camp had started, became the third player to notch save No. 300 in a Mets uniform, joining John Franco and Billy Wagner. He became closer once K-Rod was traded to Milwaukee, and was sitting at 293 saves at the time. Isringhausen's first save came with the Mets on July 6, 1999. “It puts him in the elite group of closers that have ever pitched in this game, and he certainly deserves it,” Terry Collins said. “I’m sure he’s been on pins and needles all week long. I’m sure he’s been going crazy trying to wait for an opportunity to get his 300th. I’m just glad we got it out of the way. Now we can move forward. Said Isringhausen: "I'm just glad it's over with and we can go about playing baseball." Isringhausen went on to say that with postseason saves, he actually already achieved the milestone. "I had 11 in the postseason, so in my mind I had it," Izzy said. He added about reaching the milestone with regular-season saves only: "I didn't know if it was ever going to happen, because of all the injuries and stuff. At one point I didn't plan on playing anymore. But then my arm started feeling better after the surgery, and I was slinging a softball around, and just thought I'd give it another shot."